How about you? What helps you change your attitude from negative to positive when life gets stressful and painful? Leave a comment below and share your thoughts and insights. This article could not have come at a more appropriate time to affirm positive steps I’ve taken and remind me to keep looking forward. I’ve been embroiled for the past seven years with a vindictive, narcissistic ex-spouse who has tried every angle to twist the truth in an attempt to destroy me. Presently, he has created a major child custody battle. His antics used to render me nearly nonfunctional. In his efforts to destroy my, I credit him, though he does not know this, for being the catalyst to change me into the person I am today. I’m stronger, focused on truly living each day appreciating what I do have, and silencing the old voices in my life that were his lies to listen to the voices of truth that are a positive reality in all aspects, except where he is concerned. I’ve learned to focus my energy on being active in my children’s lives and my community to make a positive difference to someone else. Yes, each ‘ending’ is also an exciting new beginning. Thank you, Marc and Angel. Life is amazing, in the positives and negatives. I too am in the mist of a similar life altering event, but the day my ex kicked me out of our house, I knew I had to start my life. I now have custody of my 2 kids, and working on getting visitation rights to my 2 older step kids. It now is exciting to realize I truly can do what ever I want to do. Extreme pressure on coal produces a diamond. I so agree with you. In Buddhism, it’s said that “the mind is the universal ordering principle.” Everything depends on our perceptions. I’m a big fan of #1. I find so much freedom in stillness and the space for new solutions and ideas to arise. Hey Marc. I just want to say that what you and Angel write about is really helping me out. For the past few months I’ve been suffering from depression caused by a severe loss in my life. Your words really inspire me and it makes me realize that there is far more to life than feeling sorry for myself. Thank you. For me, it really all about positive reminders, which is why I have read and re-read your parts of book and many of your articles several times over the past year. Doing so has helped me stay on the right path. I so look forward to my bi-weekly dose of inspiration from your emails and blog posts. Today’s post has given me much to think, cry and smile about, especially as a new cancer patient who has not come to terms with the disease. I try to keep the beauty of each moment in mind. I try to be as present as possible with the time I know I have right now. And I’m really only beginning to realize how much I was once overlooking. I understand this intellectually, but struggle with the fact that when things have changed in my life it sometimes seems like the “bad guys” won. Taking it on the chin and focusing on what you have may save you sanity to some degree, but it often leaves a sense of disquiet, and turning the other cheek does not necessarily come with a sense of acceptance. I can’t quite reconcile my feelings of defeat. Perhaps I am just not that noble. Where does this leave justice or fairness? Just asking for some clarity. That is the difference of thoughtful living, thoughtless living and living in reality. Reconciled minds never create, they just survive, but minds like yours searching for clarity, justice and fair play are restless and such minds only can create. Light and darkness, success and failure and many such opposites can’t be eliminated. In this duality we have to evolve our reality and live to leave something for the future. This is merging with the Ultimate One, Salvation and in Sanskrit it is called ‘Advaitham’ ie., the way to unity. Thank you “marcandangel” for initiating this discussion and all those who participated. Once again your skilled writing on subjects that are so important come at a crucial time in my life….thank you for always making me feel better and stronger and beautiful!! This was exactly what I needed to hear today! As I get ready to face a very difficult few weeks I can go back to this article and it will help me stay focused on the positive. I thank God for sending this to me and answering my prayers and as always, Marc and Angel for being there. Thank you for such an inspiring post. In answer to your question about what changes one’s mood, I have gotten into the habit of acknowledging to myself the mood I’m in, and then consciously reversing it and telling myself “just do it”. There is no “trying” … only “doing”. Eleanor was asking in her post, “where’s the fairness and justice?” I have always believed that “life isn’t fair”, so I don’t think of fairness and justice at all as something owed to me in this life. I really like many of the Buddhist concepts, but believing in karma is one concept I don’t subscribe to. Nor do I believe “what goes around, comes around”. Saying those things to yourself feels like a crutch to me. I think its fair to note that all of these are LEARNED. Very few people are born with these concepts. These things are best studied and practiced, then they can begin working for you. For me music works wonders. My mood changes as soon as I change the beats. When i feel too low i try to hear some fast beats to cheer up and most of the time it helps. Meditation and intense focus on the present moment – it always helps me clear the chaos I can’t control out of my mind. I’m having ovarian cancer surgery on Tuesday. There is very little about this situation I can control. These ideas come to me at the perfect time. This post came at the right time (it always does). Once again you’ve given me the gift of insight. I struggled all weekend in the process of having to move boxes of my son’s belongings. Although he died many years ago, having to go through his things made the loss even more palpable and fresh. I cried the whole weekend. I woke up this morning, anticipating another day of sorrow, but I read your post and decided I didn’t want to feel pain today. It doesn’t mean I will never feel the pain again, it just means I’m giving myself a choice today. Great post, as always. Thank you. Its so easy to wander back in to insecurity. Not a pleasant place but familiar. I found myself alone, sad and sinking. And I remembered short blurbs from your book. Flip perception. Lonely can become solitude – frustration with another person can become a lesson in boundaries and practice in self-pacification. Great article Marc and Angel. Which brings me to my point of view about free will. The way we choose to perceive things and our desire, are the main aspects of our free will. And that’s what we should focus on. Sure, you have some control over your actions (sometimes your will to make a change isn’t strong enough and it doesn’t produce an action. In this case prayer or meditation strengthen your will and give you tools to produce action). But you have no control over the outcome. Life is a journey with ups and downs. And you can suffer or enjoy every moment of it. Marc And Angel’s articles are always great inspiration!!! Thank you Marc and Angel. These articles always come at the perfect time.. In the morning.. I’m currently in situations, that stem from me being young wild and free.. Not having a care in the world. Thinking I really knew myself, but when reality set in,it was a facade.. So I totally understand the concept of closing that era in your life to start anew. With that being said, sometimes you can have bad days, (we’re human) but there’s so much we have to experience and look at to be thankful for. And that can turn your gray skies blue. Inspiring. Thank you so much. I always find it Amusing when I look back after a year or so at all the coming tragedies I worried about… that ended up Never happening. Thank you so very much for this beautiful article. I am indeed in the same predicament as you have mentioned, feeling like quitting, unable to understand the circumstances… confusion in life. But, yes this article has made me to think for a while and see things differently. 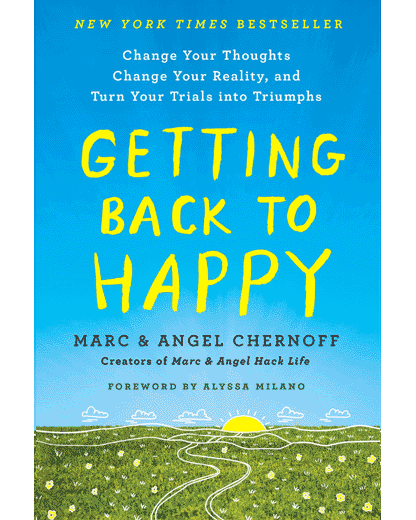 When I feel down or need to change my attitude to a positive direction, I read and look for answers to my dilemmas in places like Marc and Angel’s blog. Thank you for all the wisdom you share! Helpful article. Well written and inspiring. Thanks for this post. I am a bit off at the moment and reading this just helped me to become centered again. Thanks for also reminding me that if things are going easy it is not the right way. I have been struggling for a while and the pain is great and I keep asking my self why me all the time. This helps me to redirect my focus and start looking at things differently. Thank you very much for your life changing writings. I’ve been having insomnia problems lately and through this I have figured out why. I am a terrible procrastinator…my house and my lIfe can get in a really big mess. When I have a really big mess… like right now every pot and pan and fork in my house are dirty and I’m down to only the clean underwear that is too small or else the elastic is worn out. I feel guilty going to bed and leaving this mess, so I jUst don’t go to bed! Right now it’s 4:43 am andI’m lying on my couch still fully clothed and uncomfortable. Can’t go to bed till everytHing’s done so instead of getting it done, I just don’t sleep…lol. Gotta change my lazy attitude and my lazy body. Got any suggestions for that now? I appreciate your work and would like to learn more from your writings. Thanks. Hello Marc and Angel. I am new to your site but absolutely love it…. I wish there was some kind of way to convince you to be my mentor…. Hint…. Hint…. Lol. Anyway, I was googling, “How to think more positively” and up pops your amazing site. Your latest post about Ways to change your attitude when you can’t change anything else really identified with me, 1. Because I realized I am doing some of these things, but it added an additional perspective as well as further knowledge on techniques that work, and 2. It inspired me to start my own blog on being Solutions Focused. I wrote an affirmation a few years back for a class. It reads,” I am bigger and brighter than all my problems, and constantly choose to be solutions focused.” The only thing I know about blogging is how to write content, but once I get going I would love to have you guest post or vice versa. Please keep me in mind, I just started yesterday, I will be dropping in regularly. If there are any tips you would like to pass along please feel free, my mind is a sponge! I love what you two are doing here. It gives me hope for this world…. People are trying to be better people! In the past, music was my favourite “get-away tool” whenever I was down and out. I was a music addict (not that I was depressed tho). Then I quit the addiction. It was then that I realised that music is just a total distraction and that it does very little to make things better. Its like taking anaesthetics to numb your pain. we all know that anaesthetics just mask the pain on a short term, they do nothing to heal the source of the pain. I discovered self-reflection just afterwards and ever since life, for me, has never been the same. It has taken on a new meaning and whenever I’m down and out, I don’t try to numb the pain, I just head straight for the source of the pain through self-reflection. Through this exercise I get a diagnosis (clarifying the reason for the pain) and then I seek help or medication (Please, pardon my medical terminologies :D) through amazing blogs as this, books, prayers and so on. Now with this knowing, I have been able to redefine problems and challenges as opportunities for growth (physical, mental and emotional) rather than whatever negativity they seem to represent. Nice reminder that we really do control our experience of the world. Sometimes it feels difficult to change our attitudes when nothing is going to plan. By finding that peaceful place within us and choosing to act rather than react to our circumstances, we give ourselves great opportunities to grow. Hi Marc & Angel , thank you again for an beautiful and inspiring blog which also comes at a great time for me as I am on some tough medical treatment. I hope you have heard Allegri’s : Miserere Mei Deus on YouTube – it is true complimentary medicine. Best wishes. Whether the things you’re struggling with are huge or minor, attitude is arguably the biggest contributing factor in how it ultimately goes for you — never underestimate your own ability to determine how you handle rough patches. I take a breath and tell my self that this will be over eventually. Just deal with it the best you can and try to get through it. I learned this in the dentists chair. Knowing there is an end to the discomfort makes it easier to get through. And as you say, every ending is a new beginning. Knowing that something new will be here shortly helps me get through those difficult transitions. Thank you so much for this post. Been going through a tough time in my head and i felt this article was written for me. So useful. @Eleanor Duff: I believe Patti is on the right track. Life isn’t fair, it’s what you make of it. @Everyone: Thank you, as always. Your kudos and shared wisdom motivates Angel and I like you can’t imagine. Really enjoyed reading your comments on this particular post. I just read this a couple of days later but I do believe everything happens for a reason. Thank you for this message, reading this helped me change towards a better attitude with something that happened at work. When you are a loner which I have accepted and know my limits reading these helps people such as myself. Good job Marc and Angel! This final statement is so powerful in its simplicity. Thank you. Thank you for this post, love the help!! Great advice that has helped me see the lighter side of things and how to change things from negative to positive. Acceptance is also key. Thanks for sharing this very helpful post. I just wanted to say: Thank you. The words you both write are helping me survive a really bad moment in my life. It keeps reminding myself I have the strengh to move on and be better and happier. My mantra for changing perspective is – I thought my life was a tragedy until I realized I had a choice. After which any one of these suggestions can be used. Thank you so much for another inspiring post. One of the things I love so much about this community is that there are no haters in the comments. The commenters are also inspiring to me.